Education for the many, not the few. 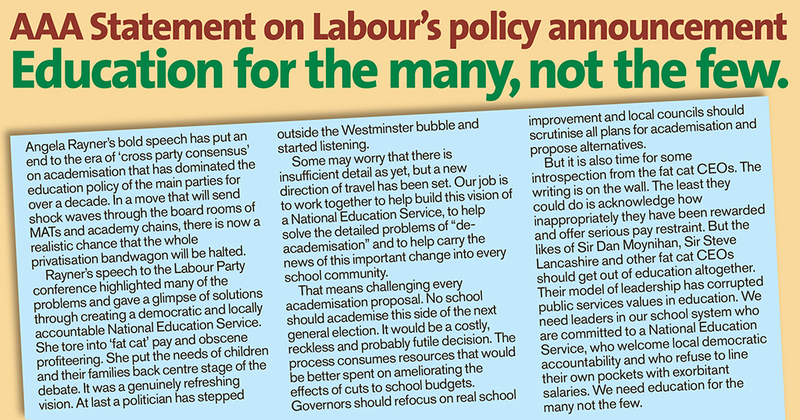 Angela Rayner’s bold speech has put an end to the era of ‘cross party consensus’ on academisation that has dominated the education policy of the main parties for over a decade. In a move that will send shock waves through the board rooms of MATs and academy chains, there is now a realistic chance that the whole privatisation bandwagon will be halted. Rayner’s speech to the Labour Party conference highlighted many of the problems and gave a glimpse of solutions through creating a democratic and locally accountable National Education Service. She tore into ‘fat cat’ pay and obscene profiteering. She put the needs of children and their families back centre stage of the debate. It was a genuinely refreshing vision. At last a politician has stepped outside the Westminster bubble and started listening. Some may worry that there is insufficient detail as yet, but a new direction of travel has been set. Our job is to work together to help build this vision of a National Education Service, to help solve the detailed problems of “de-academisation” and to help carry the news of this important change into every school community. That means challenging every academisation proposal. 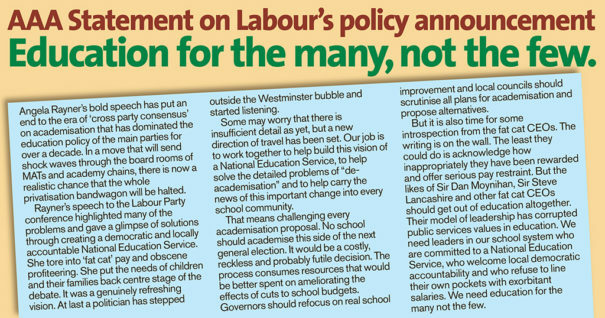 No school should academise this side of the next general election. It would be a costly, reckless and probably futile decision. The process consumes resources that would be better spent on ameliorating the effects of cuts to school budgets. Governors should refocus on real school improvement and local councils should scrutinise all plans for academisation and propose alternatives. But it is also time for some introspection from the fat cat CEOs. The writing is on the wall. The least they could do is acknowledge how inappropriately they have been rewarded and offer serious pay restraint. But the likes of Sir Dan Moynihan, Sir Steve Lancashire and other fat cat CEOs should get out of education altogether. Their model of leadership has corrupted public services values in education. We need leaders in our school system who are committed to a National Education Service, who welcome local democratic accountability and who refuse to line their own pockets with exorbitant salaries. We need education for the many not the few.